About meI am married with two daughters, a 15 year old and a baby under a year old. I live in Brooklyn, NY and work in lower Manhattan near Battery Park. About my libraryI am an avid reader and collector of hard boiled and noir mysteries. My reading interests span the era of the classic hard boiled authors of the 1930's and 40's to contemporary crime writers. 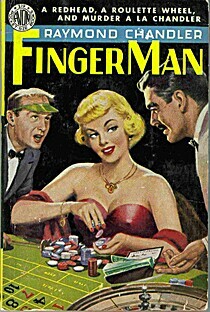 My primary collecting interests are Raymond Chandler and Lawrence Block. Authors I collect to a far lesser degree include William Lindsay Gresham, Chester Himes, Charles Willeford, Edward Bunker, Michael Collins, Daniel Woodrell and Loren Estleman. I also enjoy collecting mystery reference works and biographies. I primarily collect hardcover first editions, but I also have a number of limited editions, various reprint editions (i.e. Grosset & Dunlap, photoplay and Folio Society), vintage paperbacks and uncorrected proofs. Highlights in my collection include a first edition of Chester Himes' first book, If He Hollers Let Him Go, a first edition of Edward Bunker's first book, No Beast So Fierce, my collection of Raymond Chandler first editions and among my most prized items, a signed typescript of Lawrence Block's Matthew Scudder novel, A Stab in the Dark, bearing it's original title, Deep with the First Dead. A few of my favorite reference works include, Private Eyes: One Hundred and One Knights, A Survey of American Detective Fiction by Robert Baker and Michael T. Nietzel, 1001 Midnights: The Aficionado's Guide to Mystery and Detective Fiction by Bill Pronzini & Marcia Muller and the St. James Guide to Crime & Mystery Writers. The majority of my books were acquired from Ebay, ABE, Albiris, library sales, used bookstores and thrift stores. As my wife can attest and to her great dismay, I enjoy exploring Goodwill and Salvation Army stores any chance I get. My best thrift store find was a first edition in dust jacket of Miami Blues by Charles Willeford for $2.00. Not bad for a $100 & up book.